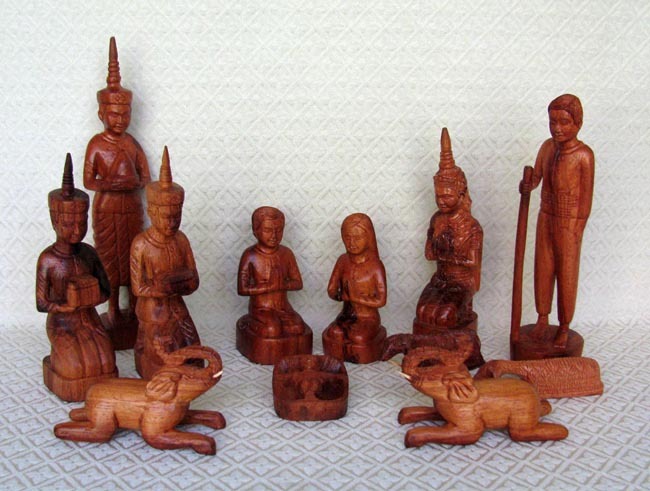 This Nativity set is carved from a brown wood called Thnong in Cambodian. The set features 12 figures: Joseph, Mary, baby Jesus, a Khmer-style angel with fancy pointed headdress, a shepherd accompanied by two sheep, two elephants with trunks up for good luck, and three Khmer-style wise men with gifts. The standing wise man measures 11 inches tall to the top of his pointed crown. The set was designed by Pu Chomraun. Chomraun worked on and off as a wood craftsman in the small Cambodian province of Kompung Speu from the time he was young. As his skill grew, he had so much work ten years ago that he felt he couldn’t complete the orders by himself. He decided to hire other carvers. Now Chomraun has 13 employees who work on five different projects, including his detailed wood Nativities. $365. Please click here for purchasing instructions. Special order.